Heat oven to 500°F. Cut potatoes in half. In large saucepan over medium heat, simmer potatoes in 2" water about 15 minutes or until tender but not falling apart. Drain well. In flameproof baking dish or large skillet with ovenproof handle, heat oil over medium heat. 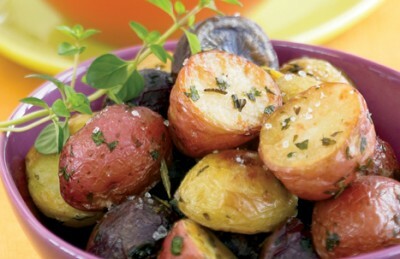 Add potatoes, parsley, tarragon, thyme, rosemary, salt and pepper; stir or toss briefly to coat potatoes. Place skillet in oven about 5 minutes or until potatoes are golden.